I've been with Kermans since 2007 and before that I was an interior designer. It was a natural transition for me to use my design experience and creativity to assist our customers in making the best decision. I have learned to appreciate all the concerns and desires that our customers face. 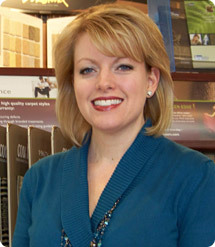 Nichole says, "I love working with each customer’s style to select the perfect material and design for their home. I really end up building a relationship with my customers and that’s my favorite part – making sure they are comfortable through the process and happy with their results." In my free time, my two boys and my husband keep me busy at home. Little boy’s are the cheapest entertainment. They are always making me laugh with the things they do and say.